Trump seems to be gathering support from a significant section of the American Christian community. I wonder why? His comments about many groups, including women, Mexicans and Muslims, and now advocating torture, is contrary to what the Christian message is supposed to be. Yet the more outrageous the comments, the more conservative Christians seem to be drawn to his form of intolerance and bigotry. I keep asking myself why? Christians here in Aotearoa New Zealand clearly don’t see any part of Trump’s message as Christian, and a church in Auckland has expressed its opinion rather bluntly. 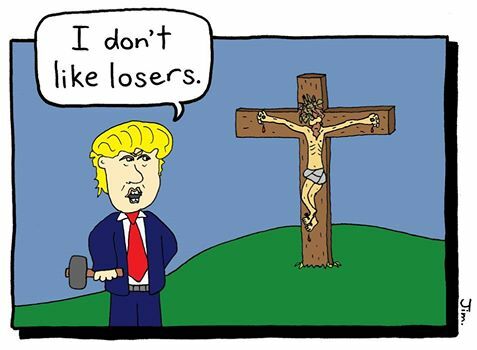 It has put up a large billboard which depicts Jesus nailed to the cross, and Trump standing before him holding a hammer in his hand and saying “I don’t like losers”. The minister of the church says Trump’s message directly contradicts the word of Jesus. No-one will convince me that Jesus was anything other than a human being. I like much of his message, even though the Gospels distort some of it in an attempt to make him greater than he really was. St Luke’s minister Glynn Cardy says that the billboard will stay up over Easter and as long as Trump’s candidacy is undecided. Should religion keep out of politics, and if so is this billboard crossing that line? Personally I don’t think so, but then we Kiwis don’t have large numbers of those who believe in Bible literalism to contend with. Perhaps if I lived elsewhere, the US Bible belt or some east African nations for example, then I might think otherwise. Categories: Politics, Religion | Tags: acceptance, democracy, religious beliefs | Permalink. Thank goodness not all Americans think Trump is the next Messiah. Apparently, after the news that Trump had secured big wins from the Super Tuesday rounds, enquiries overwhelmed a Canadian Government immigration Website causing it to crash. If Trump does win the presidential race, will Canada be far enough away? Come to think of it, will Aotearoa New Zealand be far enough away? Antarctica, may find itself with its first permanent immigrants. And Google reported a large spike in “move to Canada” searches. Of course his supporters are likely to blame both events of the success of Hillary Clinton in the Democrat primaries, but that’s the kind of nonsense they will fool themselves into believing. Meanwhile the rest of the world wonders how so many Americans have fallen for Trump, hook, line and sinker. To gather in the conservative, and Christian fundamentalists, he now claims he’s a Christian – just like them. But is he? I guess it depends on what qualities one considers are necessary to justify the claim. From my perspective, he lacks even the barest minimum qualities. Fellow Kiwi Bill Peddie is asking this question in his post Is Donald Trump a Christian? It’s worth a read irrespective of whether your are a believer or a non-believer. How authoritarian is the US? How despairing are its voters, to be shilled by this man? Categories: Politics, Uncategorized | Tags: beliefs, democracy, international events, religious beliefs | Permalink.